Many, many nights I have wondered as I lay down my head on the pillow if Ash will ever experience the normal joys of childhood. Things like kindergarten, sleep overs, and best friends. I've cried a lot of tears over the losses in her life because I know how precious things like this can be, and I so desperately want for her to have them. I wouldn't re-live the pain of a year ago in her life for anything(exactly one year ago today she was ex-planted and we were devastated), but one of the blessings that came out of such a painful time was one of the things I had longed her whole life for her to have. A true friend. Funny how God gives us some of our most precious gifts in the midst of some of the most hurtful circumstances. Always working it for our good. Sweet Allie is 6 years old. She loves my Ashley. She is the funniest girl. I can't help but smile each and every time I listen to her talk. I love to hear about all the things she has to share with her mommy on the drives to and from our home. God blessed my Ashley in the midst of her pain. He gave to her Allie. Her best friend. The sight of those last two words on this screen brings tear to my eyes. Allie is precious. She plays ball with Ashley Kate. She plays I-pad with Ashley Kate. She gets drinks of water for Ash when she's thirsty. She's not afraid of Ash. She loves her. She is concerned about other kids finding out that Ash has diapers on under her clothes. She doesn't want them to make fun of her. That conversation with her blessed my heart. Brought tears to my eyes just as each glance of them playing together in the other room does. I'm so thankful that Ash has a friend who loves her. SO thankful. My dear Allie at 6 years old you won't be able to understand how very much you mean to me, but one day when your all grown up I know your mommy will share it with you. She will tell you what a wonderful friend you were to Ashley Kate. She will share with you stories about the memories you are busy making with Ash. I can't keep from crying each time I witness them taking place in Ashley's bedroom or in the playroom. Your are a gift from God straight to us and I am thankful for you. I love you sweet little girl. Love you so very much. You are an answer to my prayers. The song from the Fox and the Hound is playing in my mind as I glance through the photos I took this week. It is a beautiful example of Ashley Kate and her new best friend. The differences don't seem to matter to either of them. I love that. I really do. Living in a world where tiny girls get sick and their mommies are left wondering what to do, where to turn, and how to get them back home can be hard. Some day are harder than others. There are days full of smiles and lots of giggles and there are days full of booboos and lots of owies. Its hard to not carry the burden of our community on your heart. You meet, fall in love with, and follow the daily ups and downs of their stories and before you know it they have captivated a part of your heart. My heart is heavy with the weight of the struggle. Our struggle, our dear friends struggle, and the struggle of transplant period. My thoughts are with my friends tonight. I wait for word of their status just as the rest of their readers do but yet my wait feels a little different than most that follow their stories. I've actually stood in the same places, slept in the same chairs, and boarded the same life flights with my own tiny girl and I know the weariness of the journey and the ache of a mommy's heart. To my dear friends, as you stand by the hospital beds of your tiny girls last night, tonight and every night in the future please know that I am with you in thought, in prayer, and your most precious gifts are in my heart as well. I love you both dearly and I love your little girls so very much. I hope you can feel a tiny piece of your heavy, heavy burden lifted as those of us across the country lift you up to our Father. She's had a lot of fun today learning to maneuver her way around the house. A mixed bag of emotion is what I'm carrying today. I've been reduced to tears by the mere sight of the chair...and...I've been moved to tears by the sight of her independence. For the first time in her life she has the ability to really go wherever she would like to go. Although my heart aches because of the way she has to get there, it still rejoices that she can in fact can get there. She is absolutely amazing. In just a matter of hours she has learned how to go forward, backward, turn around, and get into trouble. Nothing in the house is safe if its in her reach. She's trying to open doors, take breakables off the bookshelves, and dump out cups belonging to whoever left it sitting out. Nothing is really safe if its in her path or her reach! I kind of love that(secretly I'm smiling). I've watched Blake and Allie go from looks of "I'm not so sure about this" to looks of "I'm so PROUD of her". To be honest those looks can be found on mine and Dave's faces too. There is pain. The presence of the chair represents the death of a dream. At least there is grieving over that dream we had for her right now anyways. Maybe not forever though. She may learn to walk someday. At least I hope that she does. Still this is what she needed for now. Its taken close to 6 years for our family to get to this place. We so desperately want the world to see Ash as normal, not disabled, not handicapped. I know its not reality, but this is an emotional journey that we are all on together. Just being honest. This chair gives her the ability to roam inside the house without running over anyone or anything and causing too much damage(her power chair gives her a little...too..much... power. Right now anyway). Ash is proud. So proud! She can go fast! Faster than she ever has on her own. I can't imagine being Ash and never having the opportunity to go and do what she would like. I've often felt great sadness for her at being "placed" somewhere her whole life. I just wanted her to have a choice about where she wanted to play or where she wanted to go. This new chair is giving that choice to her. Within reason of course. So, as with most things on this journey, I feel sad and I feel joy. I won't lie and say that it doesn't hurt because it does. Thankfully though it also brings us great joy to watch her explore her world a little bit more. Great joy to watch her live. So look out world...there's another set of wheels in town. Friday afternoon I walked to the mailbox. Inside it I found two or three envelopes. As I walked up the walk back toward the front door one of those envelopes jumped out at me. The return address was the all too familiar Nebraska Medical Center envelope. I figured it was just a reminder of this or that or perhaps something from the billing department(there has been some confusion with a current patient and Ashley in that department and we are being billed for their pharmaceuticals. How does that even happen?). I didn't realize right away what the content of that envelope actually held so once I opened it up I was snapped back into our reality instantly. Inside the envelope I found a document informing me that the hospital and the insurance company had reached an agreement and that the following had been approved. Intestine Cadaver. Pancreas Allograft. Liver Graft. Musculoskeletal Surgery. What about those words made me hold by breath unintentionally? Why did they snap me back, take me by such surprise, and send a physical pain through me that went straight to my heart? How can words on a page do such things? I think I can answer it today. Death. Of a child. A hole left in a family. Grief. Pain. Loss. It all must happen for it not to happen in our life. That is the reality that Dave and I live in. Even though I can distract our hearts for a while with plans of busy schedules, vacations, and birthday parties it all comes back to this reality. Ashley Kate will only survive once another child does not. In moments like this I am rendered speechless. I have no understanding why this world works the way that it does. I can't interpret God's plan. I don't get it. Any of it. NONE of it makes sense to me. I hate that word. Cadaver. I hate what it has done to my heart over the last few days. I hate that I lie awake at night wondering who, when, where, how or if ever. I hate this place that we have been put in. I hate that my sweet Ashley will be thrown back into the middle of it all to battle her way out just to have the opportunity to live the life she loves. It all makes me so very sad. My heart is heavy today. So heavy that even carnival projects can't lift the weight of it all. I'm so glad today is Thursday. Since its Thursday that means its actually our Friday! I mean we still get Friday, but Dave is off on Fridays so Thursday night is the night we actually treat like our Friday. Confused yet? Basically what it boils down to is that Dave will stay up late working on projects with me instead of needing to get to bed because hes going in to the office the next day. Yippee! 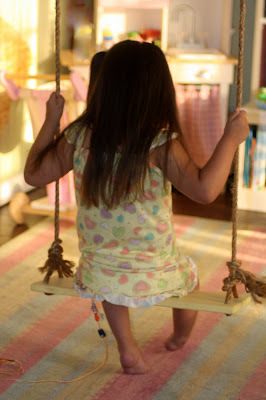 When I look around the house I see so many wonderful things that have been completed for Ash's carnival. I'm so excited! When I look at my list I see so many wonderful things that have NOT been completed for Ash's carnival yet. I'm still so excited! Tonight I hope to finish painting banners. Just little details left on those and then tomorrow we will get the gromets in the last 6 of them. I also hope to get the kissing booth and the photo booth constructed tomorrow. If all of those things are accomplished this weekend complete with painting then I know that we can make a final push the next Thursday and Friday and have everything done just the way I have envisioned it. It should be just enough time to finish it all. I have one more large delivery that I'm waiting on and then its all here,except the food items. Those I will pick up the day before. Every time I hear of someone who is planning to attend it puts a huge smile on my face. Ash is going to have one of her very best birthday parties ever. I wasn't sure I could top Candy Land which was my personal favorite, but I think I have:) Dave and Blake loved the Luau Party the most, but I know this one is even better. Last years was pretty amazing just because it was pulled off in such a difficult situation, but the pictures make me cry when I see just how fragile sweet Ash was. I'm holding out hope that she remains just as she is. 16 days away. It gives me goosebumps to think about it. I'm so blessed to have this opportunity to celebrate her life. Can you even believe she is almost 6 years old? She really is going to turn 6. Despite it all our tiny gherkin is going to be 6. Hope to see you guys at our place on the 6th. Its going to be a celebration! For the first time in an entire year Ashley Kate ate. And ate. And ate. It was the funniest thing she's done in a while and that is saying something cause she's always funny. I'm not sure why I decided she should get to eat again, but while I was at the store this week I picked up a few jars of her one time favorite foods. Then we went for it. She was so happy. So happy! If I put the jar down she would grab my hands and make me pick it back up. She sat on her little perch and smiled and giggled and swallowed and was absolutely giddy about the whole process. She would lick her lips and say, "mmmm" and sign "more, more". If the jar would empty out she would sign "please more". I was cracking up. We were trying to be cautious since we had no idea how her little body would react to eating with no where for it to actually go, but she wouldn't allow us to be cautious. After about a jar and a half of food she was topped out and up it all came into a towel. Afterward she asked for a drink and then "more, more please". So...what was I supposed to do? I gave her more. The entire time we had her tummy open to drainage and so technically she "ate" none of it. She got no nutrition or caloric intake from any of it but the process made her giddy. Absolutely giddy the entire time. It was precious! I couldn't get over the "licking of her lips". It just tasted soooo good she couldn't miss a bit of it. I didn't even realize how much she missed the opportunity to eat. Its been over a year now since she became sick again and she lost so much more than her bowel. I forget sometimes just how much of the "normal" she had worked so hard to gain was actually taken from her. Ashely has been totally fixed on wearing her shoes this week. She wants them on in the morning when she wakes and won't let me take them off even after putting her into bed. I tried to sneak them off of her about 11 last night and she woke up crying for her sandals. So... I put them back on and tucked them under her blankets. With her interest in shoe lately I have been putting her at her standing bar, forcing her stand up here and there and just encouraging her to get the feel of her weight on her feet again. Today I asked her if she wanted to walk. She didn't protest and so I pulled out her walker. I stood her in it and still she didn't fuss. Together we took a few steps and still she was being a trooper. We just kept at it for a few minutes and then I noticed she wasn't even leaning on the back of the bar. She was actually standing on her little feet. This is the first time in a year that I have witnessed her stand on her own two feet. I had to get up and grab the camera and the whole time she stood there and waited for me to snap photos of her. It was so amazing! So I decided to title this post "Moving on" because that is what I see Ashley Kate doing. She's moving on from the illness, the predictions, the struggle, and the whole insanity that has plagued her life over the last year. She's happy. She's growing. She's getting stronger. She's getting her life back and I'm witnessing her move further and further away from those dark days of last summer. There are still struggles and there are still some very raw emotions. There are still unbelievable odds stacked against her survival. There are still days of waiting on an organ list ahead of us, and days of transplant and recovery and all its evils in her future. None of this has changed, but its an attitude of "I'm going to be 6 years old despite it all " that she has adapted and I'm moving on with her. I spent a few moments peeking back at journal entries from this time last year and it brought such a remembrance of the pain and the despair. I couldn't linger there long. The heaviness of my own words pierced my heart and the tears came quickly. I had to walk away from it all. I had to. Going back is still just too hard and realizing that it is in our future paralyzes me with fear. I can't live that way. Instead I look at these pictures and I smile and I see the determination to be happy in her face and I can't help but be just as happy. We set her next appointment while at her doctor in Shreveport this afternoon. The next one is in three weeks. At which time my girl will have already turned 6 years old. If that isn't evidence of moving on then I don't know what is. I'm smiling at that thought. 6. I asked God to let her be 5 on those hard days last summer and here she is turning 6. He's good to us. He really, really is. In Texas when the temperatures reach degrees of 100 or more how does Ash spend her days? Swinging under her apple tree of course! No need to get sweaty and sticky. No need to fight off the mosquitoes. No need to worry about her overheating. So yesterday Ashley Kate spent her evening signing "swiiiiiinnng, wheeeeeee" and I spent my evening soaking up the memory being made with my sweet little girl instead of soaking up the sun! It was a good weekend. We got a lot accomplished for her birthday carnival. We watched Blake play a little baseball. We listened to Allie and her BFF laugh until they cried. We did lots of laundry and yard work. We swam a little and played on the swing a lot. Life is blessed. These days in our home are so very sweet and I'm constantly reminded why I love it so very much. Sweet Summertime days are simply some of my favorite:) Hope your weekends were blessed. Last night I turned around and found Ash hiding underneath the table in our foyer. I watched her for a long time trying to figure out what she was up to. When I asked her what she was doing she did this. Then she peeked around the corner of the leg to see if Allie was watching. For some reason she thought we couldn't see her underneath there. So cute! I stared at her for a long time and just thought to myself how very cute she is. She is just so stinkin cute. I love this big girl so much! Yesterday I visited with some new moms in one of the waiting rooms who were holding the tiniest of baby boys. They shared with me that they were both born weighing about 2lbs each. I giggled to myself and then told them Ashley Kate was born weighing about the same. They were stunned. "She looks so good! She is SO big. I would have never guessed." There was no need to share the craziness of her life with complete strangers. It would serve no purpose. I just smiled and nodded because she does in fact look so good and she is SO big. Almost 6! Unbelievable to me when I think about all the "rest". God has shown mercy and given us an amazing 6 years with our girl and those 6 years are laced with wonderful memories. Sometimes its fun to focus on her today and not worry about her tomorrow. I just catch myself watching her play and listening to her giggles and I make a point to take a mental snapshot of those moments. Last night I grabbed the camera to capture the moment on film as well. She was just being cute. So cute! Some days its overwhelming. It just is. I'm fighting back tears as I finally make it back home from a LONG day in Shreveport. When its over 100 degrees outside and you have to move your almost 6 year old daughter in and out of her car seat into her chair 8 times it not only leaves you breathless it causes the tears to fall. I just can't help it. On the drive home I feel a tremendous amount of guilt for being so exhausted by the whole process because I realize that I would do this, this exact day, as exhausting as it has been, a THOUSAND times over if it means that Ashley Kate is still here. I would. So I'm having an internal battle between my emotions and my exhaustion and all I could do was cry although it doesn't change the fact that Ash can't walk and she can't get into the car or out of the car or do any of the things that the rest of us take for granted every single day. Seriously I don't understand why a hospital parking lot will have 12 physician parking spaces all up front and ONLY 2 handicap spaces? How can that even be consider ok when designing the place? I finally parked illegally behind a fast food restaurant ACROSS the street and stood on the corner of Kings Hwy in Shreveport attempting to cross traffic with my medically fragile daughter in her wheel chair. It took 20 minutes to get across. By the time I made it into the building to her appointment with her new physicians the last thing I needed to be told as the sweat dripped off my face was that the referral was NEVER even sent. Please don't tell me that she can't be seen without it or I am going to sit in the middle of this waiting room floor and cry my eyes out because I am that exhausted. I am. It was a hard day. Its hot outside. Lifting 50 pounds in and out and in and out in 100 degree weather does not make life easy, but like I said I'd do it a thousand times over. I really would even though it makes me cry. Days like today cause her disabilities to loom over me and weigh heavily on my spirit. 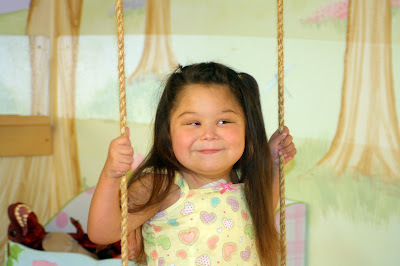 I never dreamed she would be 6 and unable to walk. It never even crossed my mind and today it brought me to tears. The invitations should finally arrive and go out this week. Its taken a little longer than expected for the artist to complete and print them, but they are finished and on there way to our mailbox. As soon as I receive them I will be sending them out to all of you. 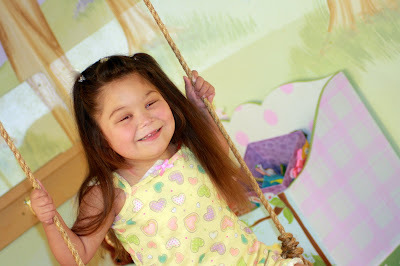 Ashley's smile and laughter fills our home. She is the happiest little girl you've ever met. She giggles at most anything. Her days are happy. Her heart is light. You don't find a trace of worry or fear in her face. I'm trying so hard to take my cues from her. If she's not wasting a moment on what her future contains then I'm trying not too either. I just want so desperately to enjoy her. So I surround myself with all things happy. I keep my eyes focused on today and ignore the unknowns of tomorrow. We have had two full nights sleep without the running of IV antibiotics. With all that extra sleep there is no limit to what we will accomplish this week. I love sleep. Really, its such a great part of life when Ash is well. She looks like she has made it through this last infection. We sent blood work off to the lab this morning. Ash has had us all laughing hysterically lately. She has discovered YouTube on her Ipad. Don't ask me how she knows all that she does because I can't explain it, but this girl is funny. The other night Blake was laughing so hard at what he discovered her watching that he couldn't breathe! Her choices in video clips is vast and they include everything from real live streams of chickens pecking the ground and clucking(one of her favorites) to Al Jezeera TV! She doesn't speak Arabic and we have no interest in what is being spewed but she is hysterical as she giggles at the gibberish coming out of their mouths. Seriously, its so funny! Oh Ash, you are a funny, funny girl. Ashley surrounds us with her love. She hugs us tightly repeatedly throughout our days. She smiles when we walk in the room. She reaches for us to hold her. She absolutely adores Blake and Allison. She is such a precious part of our family. In other news our Allie made the soccer teams she was trying out for. Such a BIG deal at our house. We are SO proud of her. She also landed her first ever back tuck at cheer camp evaluations yesterday! Equally as proud of her for that. She was so thrilled and we even caught it on video:) Allie has a very big year ahead of her. She will be cheering, playing school volleyball, basketball, and pole vaulting. In addition she will be playing club soccer in Arlington every other weekend and club volleyball in Dallas. Her energy and drive makes me tired just watching, but I LOVE her love for her life. Blake has two baseball games this week and workouts every afternoon in Henderson. I'm super excited to watch him play. On Wednesday Ashley and I will spend the entire day at LSU and then Schumpert as we move through her appointments. Its going to be a long and draining day. Just the transferring of her from the car to her chair multiple times that day has me dreading it. Its getting so hard. Oh well, she loves to go, go, go and gets so little opportunity to be out and about she's actually going to enjoy it all. The car is one of her favorite places to be. Somewhere in all of this running I have got to fit in an eye exam for myself(I haven't gotten new glasses in 5 years, oops) and a hair appointment before the gray takes completely over! Its NEGATIVE but thats POSITIVE! The call just came in. Well, actually two calls came in, but lets talk about the first. Ashley's cultures from the 1st are all NEGATIVE. I can't even tell you how good it feels to hear those words. Knowing how difficult this bug is to clear and that no one expected it to clear I'm just absolutely thrilled! We will continue to treat through Saturday and then be done. A full nights sleep for all of us. I'm just so happy. Ash looks great this week. She is happy, playful, giggly, and moving about. She managed this infection very, very well. It was scary for a couple of days, but other than that she did really well here at home. I'm so proud of her. So proud of she takes it all in stride and keeps being Ash. She has to be the most well behaved child I've ever known. She has grown and matured so very much. On top of all that she is just so stinkin sweet. The second call came in from our transplant coordinator. Just letting us know the surgeons decided that they would indeed be willing to list Ashley Kate for transplant as soon as we are ready. We aren't listing her at this time, but when the time comes that we all agree to then she will in fact have a spot on that list. I guess you could consider that positive although the whole need for another transplant is negative. We are adding a new physician to our semi-local team. Not because we want to, but because we are being asked to. Next week Ashley will be seen by an infectious disease doc from LSU. He works with our pedi-surg team in Shreveport. They requested he be on board for the next round of infection. Everyone expects there to be another one around the corner. Of course I hope she can prove them wrong, but it is the cycle of life that she is currently living. One infection after another. Our philosophy is always less is more. The fewer times she can be in physician offices, the fewer doctors we have to take her too, the fewer labels and diagnosis, allow her to live a fuller life. Its the way we parent her. Our choice to try and normalize her life as much as we possibly can. I'm sure he will be a welcomed addition in time of crisis. I just don't intend on adding another trip each week to his office just so we can chat. Only when needed after this first meeting. Today will be more of the same for me. Painting, sewing, constructing one of her best birthday parties ever. Its sooooo much fun preparing for. My lists seem to be getting longer everyday, but more and more are being marked off as I end each day. Its really fun to be back in the playroom painting away with Ash underfoot just as we were last summer. Some bittersweet memories, but we are looking forward to her party trying not to remember how wrong things went a year ago as we prepared for it. Lots to do today. Its just so much fun! Blake and I made it home from Waco about 2 am this morning. The guys on the East Texas Elite clinched a championship title after coming in as the runners up our last two trips to Waco. I'm glad to say we did it, but I'm also glad not to have any plans of traveling back to Waco in the next few weeks. Blake and I have had some really good times, lots of laughter, long talks, and just great quality time on the road together. It's been memories I'll not soon forget, but when you add those long weekend trips into the schedule we are keeping at home I'll be the first to admit how tired I am. I did get the opportunity to sleep for 9 straight hours one night in the hotel and I came to the fields announcing how much I LOVE sleep. Anyway, I'm home now and that mean that I'm up. Its my turn. Dave did such a good job taking care of Ashley Kate while I was away. She looks SOOOO much better and stronger than she did just a few days ago. We are really excited about that. Today she started moving around the house again and that is a for sure sign that she's on the mend. As I worked on a project for her birthday party at the sewing machine tonight she was under the table and under my feet. I couldn't help but smile. I love to see her feeling better. We made it 48 hours with no growth and I'm waiting to see if we are going to get 72 tonight. Once we make it that long we will continue her med schedule for 10-14 day more days and then things will get a little easier. I'm hopeful she's beat the odds and has cleared those bugs that have everyone so worried. In exactly one month our baby gherkin will turn 6 years old. Unbelievable. That gives us 4 Saturdays until her party. I am working non stop to get it all done. Its going to be so fun. We are all looking forward to the celebration. Everyone loves Ashley's birthday parties. Each year we have the opportunity to celebrate her life is another year of memories we made with our sweet girl. Every single day is a day to give thanks for. I can't wait for her invitations to arrive! Its going to be a busy week. Allie has another soccer try out. She has cheer practice and then cheer camp. Ashley and I go back to Shreveport on Wednesday. Blake has work outs and practice all week long. Then the weekend will be back upon us and we will be building away on the midway as we count down the work days till her birthday. We can't wait to see everyone again. Hope you all enjoyed the holiday. We did a whole lot of nothing special. The kinds of things that have become just so special to my heart. Family life. Nothing tops it. Not in my world anyway. God has been so good to us. So very good. Blake and I are leaving for Waco in a few hours. Another weekend of baseball together:) We had all hoped to go for the long weekend, but Ashley's med schedule is a full time job and its just too complicated to travel with. Dave is staying behind and allowing me some more time with Blake. We both know that once I leave for Omaha with Ashley that I'll miss out on so much with the big kids. I love him so much for giving me these opportunities and these moments with Blake. Allie is at the lake with a good friend. Jet skiing is on the menu, and she couldn't be more thrilled. That girl and her bucket list! She loves life and loves the adventure of it all. I'm so excited for her, and the fun shes going to have with an old friend. That about sums up our holiday plans. Hope I can stay awake on this three hour drive today! Its been a LOOOOOOOONG week with very little sleep. Yesterday I struggled. For a while I just tried to figure it all out. No need to tell you it was a futile attempt. No answers came to me. No understanding. No reasons. Just confusion, questions, doubts, fears. I can't stop this from happening. I can't do anything really except keep on keeping on to the best of my ability. I want to scream and yell and stomp and let the world know how awful this is. Its just such an awful place we find ourselves in. When it all boils down this is what I know. A mom protects. A dad solves problems. In this situation we get to do neither. Tonight I found myself staring at Ashley Kate. Her beautiful complexion doing its best to cover the complex web of veins that have sprouted underneath it. You can see it now. Its visible. The breaking down of her tiny body. As her body does its best to form new pathways to move blood throughout itself. I've tried to pretend I haven't seen what I'm looking at. I've ignored it day after day after day. Then on our trip the photographers could clearly see the blue patterns climbing up her neck, sprouting through her cheeks, across her upper lip, onto her eye lids, and now her forehead. Her wrists, the insides of her elbows, her thighs, its everywhere. On Wednesday one of our doctors noticed. I can't remember what he said simply because I was stinging inside. Its real. Its there. I'm not imagining all of this. In some ways I sit and stare in awe at Who God is and how He has created her. His design is allowing her body to compensate for the lack of blood flow and create new paths to move it and keep it functioning. That is truly amazing. She was designed fearfully and wonderfully by His hands. In other ways it sends chills up and down my spine. Her body is wearing out. The strain of occluded, scarred down, catheter intruded veins are taking their tole on her. Oh how it breaks my heart! So please let me scream and yell and cry and weep and shout from the roof top how wrong all of this is! Its just so WRONG! Let me protect her. Allow her daddy to solve this for her. For us. Please give us a way to make this ok. Help us help her. My sweet Ashley giggles from deep inside of her. Its infectious. Contagious. We all sit around her on the floor of her playroom and can't contain our laughter. My precious girl you are so sweet. I love you so very much. So much I ache at the thought of trying to fill your days with a love so great that it fills you up. Do you know how much you are loved? Do you even realize how very much we wanted you? Do you know how long we waited for you? Will you ever understand how much we want to keep you? Oh how much the Father must love you. For I know He loves you more than I and for that to be true my sweet Ashley He has got to love you an awful lot. At the end of the day, at the end of this life I know the Truth. I know He is near. I know He loves us. I know He is trustworthy. Still I ache. Even though He holds us close to His heart in this life there is pain. One day there will be no more tears, but tonight they fall from the eyes a helpless mommy who would do anything to protect her daughter.